Pet ownership is a beautiful thing, but it comes with a few...well...unpleasant tasks. While there’s no better feeling that the joy of seeing your pup at the end of a long day, you still have to take him out to do his business—and of course, pick it up after he’s done. But this daily chore doesn’t have to be messy. With the right pooper scooper, picking up after your four-legged friend can be easy, sanitary and, best of all, hands-free. It may be surprising, but there are a lot of scoopers on the market designed to make your life easier. We’ve rounded up the best ones for every pet and pet owner. The Nomad Pets Pooper Scooper Set comes with everything you need to make sure you’re the best dog owner on the block. Trust us, your neighbors will appreciate your dedication to picking up after your dog, and this Nomad Pets Scooper makes it incredibly easy. Whether you have a brand new puppy or you want to upgrade your walks with your dog, this set is our favorite on the list. The one-handed plastic jaw device can tackle any size mess, and the set comes with custom sacks that fit seamlessly over the scoop. The claw is 24” long, so you don’t have to bend over to clean up after your pup. The handle is easy to squeeze (even for smaller hands), and it weighs less than a pound—so it’s not cumbersome on long walks. Owners say the Nomad Pets Pooper Scooper has transformed poop duty for good. They love how easy it is to clean up without ever getting your hands dirty. The company offers a 100% refund guarantee if it doesn’t work for your needs, but at its affordable price, we are pretty sure you’ll find this money well spent. The Pik-a-Poo One-Handed Pooper Scooper will easily become your favorite long walk accessory. This mighty little system comes with a one-handed claw scooper made from nylon and aluminum alloy, and heavy-duty plastic bags for your dog’s mess. The scoop itself is 28” long and weighs just 10 ounces, so you can use it both at home and on the go. The plastic bags attach to the side of the scoop for easy access, while the tool folds down for simple storage. The claw’s curvature is designed to work well on grass as well as concrete sidewalks and in tight spaces. Dog owners say the Pik-a-Poo is well designed and easy to take on the go. A few reviewers note that it’s better for small or medium-sized poop, so keep that in mind if you own a very large dog. If you’re hunting for a great one-handed pooper scooper that won’t leave a mess behind, this is it. If you run with your dog, carrying a pooper scooper probably sounds like a nuisance. But just because you spend hours outside with your pup doesn’t mean you have to resign yourself to a messy cleanup every time. The DogBuddy Portable Pooper Scooper is a great solution for active dog families. This mini scoop hooks onto your dog’s leash and is so lightweight you won’t even notice it’s there. Made from durable plastic, the DogBuddy holds a roll of poop bags, and the poop compartment can expand to clean up bigger-than-expected messes. It comes in three sizes (small, medium, and large) and in either pink or green. 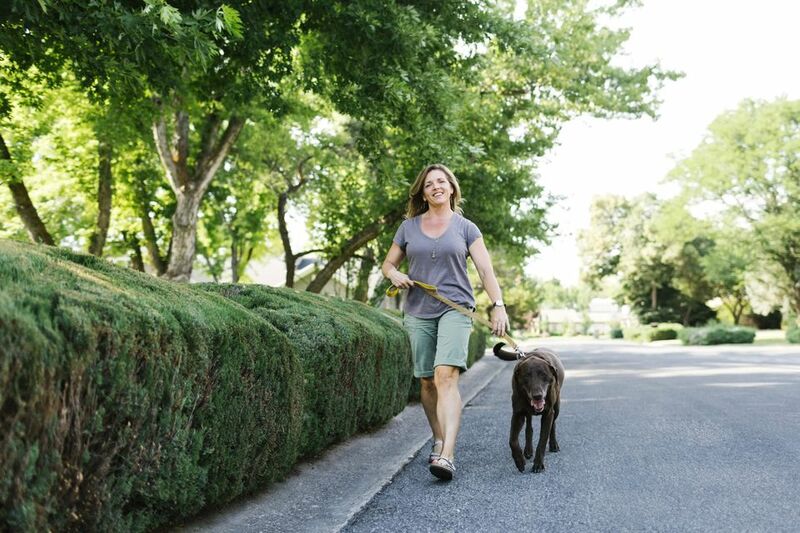 The DogBuddy was created with busy families in mind—the clip-on leash system means you’ll never forget it when you’re running out to take Fido to the park. Reviewers say it’s a smart dog accessory that makes dog poop cleanup that much easier. Though it still requires bending, many owners say it requires less effort and a smaller range of motion than picking it up with hands only. If most of your poop scooping duty happens at home, a rake and spade system is a durable, easy-to-use device that can make cleaning a big backyard mess a quick and simple task. The Royal Pet Spotty Metal Tray and Rake is a well-constructed aluminum scooper that works wonders for yards or kennels. The two pieces work together to sift through grass or glide over concrete and allow you to sweep poop into the large tray. At 36.75” long, you won’t strain your back bending over to pick up messes. Though it’s made from a high-quality aluminum, the rake and spade weigh just about 1.5 pounds together, so they’re lightweight and portable. The two pieces also snap together, so they’re easy to store and feature comfort-grip handles. The Royal Pet Spotty Metal Tray and Rake system has a lot of fans (yes, pooper scoopers can have fans!). Owners say it’s comfortable to hold, easy to use and stands up well after extended use. Some note that it could be larger (if you’re a breeder or own a lot of pets, this may be a concern), but most say it works better than any rake system they’ve used before. Whether you’re a breeder, own a kennel or just have a lot of pups, the Activedogs Best Ever Dog Poop Scooper is a handy device that will make this unpleasant task a little less bothersome. This one-handed aluminum scooper is a bit more expensive than others on our list, but it’s money well spent for large cleanups. It’s more durable than traditional plastic scoops, but still lightweight enough that it’s not unwieldy. This scoop measures 38” long and comes with either a flat tray or one with teeth. If you plan to use this device on hard surfaces such as asphalt or concrete, flat is the way to go. If you have a lot to clean up in grass or dirt, the scooper with teeth will make quick work of it. The Activedogs scoop is praised for being well made and easy to clean, and trust us — if you have a lot of poop to clean up, you’ll appreciate just how strong this tool is. Most dog owners know that dog poop can seriously harm a well-manicured lawn, but a harsh poop scoop can do just as much as damage as it tears through your grass. With a thin metal rake design, the Jibber Gear Pooper Scooper was created with your backyard in mind. Plus, this oil-treated wood and metal scoop is 48” long, so even tall pet owners will never have to hunch over during poop patrol. The long spokes work well on poop of any consistency while ensuring your grass stays intact. It comes with a lifetime guarantee against any defects, so you’ll know it’s money well spent. Additionally, every Jibber Gear is handmade in Fargo, ND, so it’s a great way to support a small business. Reviews say it’s one of the best dog tools they own, remarking that it’s perfect for any lawn-obsessed pet owner. The Doody Digger Pooper Scooper is a little different than most on our list. This one-handed tool uses gravity to clean up pet poop so you never have to bend or use your hands. Made from recycled polyethylene, the scoop consists of a 45” tube and “doody bags” that attach to the upper end, so the waste goes directly into the bag. The slick polyethylene scoop is designed to be stick-free—and because there’s no tray, it helps reduce smells left behind from cleanup. The shovel end works well on grass or hard surfaces. Dog owners rave about the Doody Digger, remarking that it’s one of the most innovative and useful pet cleanup tools they’ve ever used. Great for most day-to-day use, the scooper works just fine for dogs of all sizes. Cat owners have poop duty too, and the DuraScoop Jumbo Cat Litter Scoop is our pick for litter cleanup. This all-aluminum scoop stays clean and has a rubber handle coating for comfort. It’s an oversized scoop, but its ergonomically balanced center of gravity makes it easy to hold and comfortable in the hand. The scoop is 12.7” long and 5.9” wide and is designed to get all the waste of any size in one fell swoop. Whether you use clay, pellets or a recycled product, this scoop works with all kinds of litter. And though it’s designed with cat litter in mind, the product has been proven to work outdoors for other pets.